As 2018 draws to a close, we want to share the Year-End Planning Memorandum for your consideration. Given the significant changes to the tax code in 2018, you may want to take advantage of several of the “Action Items” that are included. Please feel free to contact either of us if we can be of assistance in discussing charitable strategies that may be beneficial as you review your year-end planning. Thank you for your continued support of the Jewish Federation and our community. Best wishes for a happy and healthy 2019. Year-end is an opportune time to consider financial and tax planning strategies. The enactment of the 2017 tax cut legislation last December makes year-end planning this year more important than ever. The tax cut legislation created significant changes, such as lowering tax rates and, at the same time, reducing or eliminating some tax deductions, credits, and exclusions. Taken together, these changes could dramatically impact your tax liability for the year. As a result, we encourage you to review your withholding and estimated tax payments before year-end to ensure there are no surprises when tax returns are filed on or around April 15, 2019. For 2018, the standard deduction nearly doubles to $12,000 for individuals and $24,000 for married couples filing jointly. At the same time, a number of commonly-claimed itemized deductions have been reduced or eliminated, the most important being the imposition of a $10,000 limit on state and local taxes for both individuals and married couples. It is imperative that you compare the total amount of itemized deductions available to you under the new law with the increased standard deduction amount. Below are a few strategy explanations and action items to think about as you head towards your end of year planning. If you claimed itemized deductions in the past, you may now want to consider “bunching” those deductions into one year in order to exceed the standard deduction amount and claim the standard deduction in other years. Perhaps the easiest itemized deductions to bunch are for charitable contributions. One way to accomplish this is to combine tax-deductible contributions that would otherwise be given in two or more years into one. Another 2017 tax law change that increased the annual cap on cash contributions to charity from 50 percent of adjusted gross income to 60 percent can make “bunching” even more attractive. Action Item: Make charitable contributions in the “bunching” year to a new or existing Donor Advised Fund (“DAF”) offered by the Jewish Federation of Cincinnati. Claim the charitable deduction in the year you make the contributions and spread distributions to charities over several years. Contact Debra Steinbuch at the Jewish Federation for more information on Donor Advised Fund: dsteinbuch@jfedcin.org or 513-985-1593. Action Item: Shift some of your tax burden to a future year. Tried and true strategies for lowering your tax bill include deferring receipt of a bonus payment to 2019, accelerating remaining deductions into this year by prepaying a deductible expense, or making larger charitable gifts. Put those saved tax dollars in your pocket rather than the government’s. Year-end is an opportune time to review your investment portfolio and consider timing the recognition of capital gains and losses for assets held long-term—more than one year—and short-term. You can avoid paying any capital gains tax on the value of securities transferred to the Federation, and you may be able to receive a charitable contribution deduction for the full fair market value of the securities at the time of the gift. Action Item: Give appreciated assets to fulfill a pledge or make an annual gift. They are fully deductible up to 30 percent of adjusted gross income, and any excess can generally be carried forward and be deductible for up to an additional five years. Action Item: Donate appreciated stock to establish a DAF or add to an existing DAF at the Jewish Federation of Cincinnati. It is an excellent way to maximize tax savings from such gifts and retain the privilege of making grant recommendations in the future. Action Item: Sell depreciated stock, recognize the tax loss, and then give the proceeds to charity. If you make a charitable gift of stock with a fair market value less than its cost basis, your charitable deduction will be limited to the cost basis. An IRA Charitable Rollover is not deductible, but because it is not included in gross income, the net effect may be the same as it would have been had you made a charitable contribution. As a bonus, you do not have to itemize to get the tax benefit of your gift, so you can still claim the higher standard deduction under the 2017 tax law changes. Action Item: Use your IRA Charitable Rollover to pay your Annual Campaign pledge, establish a permanent endowment fund to perpetuate your Lion of Judah and/or annual campaign gift, or use it to establish an endowment fund to support a charitable cause that is a passion of yours. This letter is for informational purposes only and should not be construed as legal, tax, or financial advice. When considering gift planning strategies, you should always consult with your own legal and tax advisors. 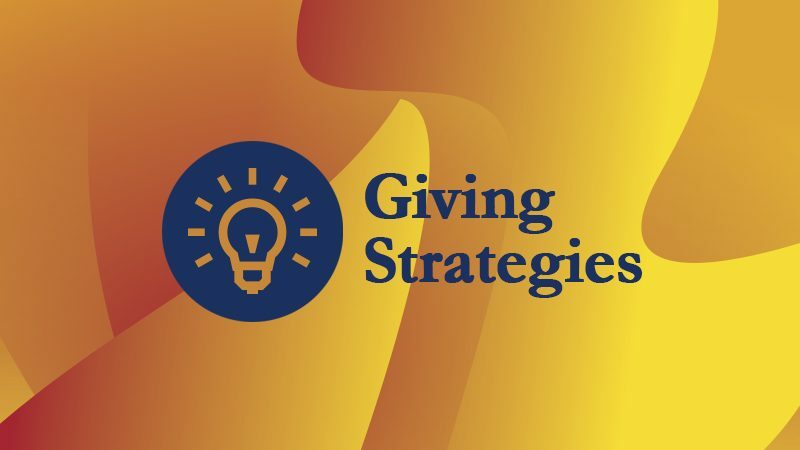 You can reach Jim Friedman, Director, Gift Planning and Endowments, at 513-985-1524 or jfriedman@jfedcin.org; and Deb Steinbuch, Manager, Planned Giving, Endowments, and Create Your Jewish Legacy, at 513-985-1593 or dsteinbuch@jfedcin.org. You can reach the Federation’s Create Your Jewish Legacy team here and the Create Your Jewish Legacy website here.